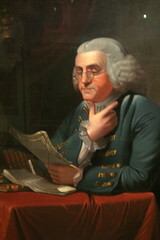 I really like Benjamin Franklin’s “The Way to Wealth”. Taken as a whole, this pamphlet has some very timely advice for the current situation in America. But you can just as easily take it in chunks and find a lot of wisdom in his witty sayings. Well, they were witty for his time and many still are. But some of the words he uses would have been better understood in his day, so I’ll try to put them in context for our time. I’m going to take many excerpts from “The Way to Wealth” and discuss them over several posts. “The Way to Wealth” begins with a scene of people about to go shopping who are complaining about the bad times and taxes in their country. (Sound familiar?) One man asks Father Abraham, the main character in this short story, for his advice. “Friends,” said he, “the taxes are indeed very heavy, and if those laid on by the government were the only ones we had to pay, we might more easily discharge them; but we have many others, and much more grievous to some of us. We are taxed twice as much by our idleness, three times as much by our pride, and four times as much by our folly; and from these taxes the commissioners cannot ease or deliver us by allowing an abatement. However, let us hearken to good advice, and something may be done for us: ‘God helps them that help themselves,’ as Poor Richard says. Yes, the taxes we pay to the government are heavy, but they’re not the only taxes we pay. Our laziness taxes us twice as much as the government does. Our pride taxes us three times as much, and our stupid mistakes tax us four times as much. These heavier taxes cannot be eased by our politicians or tax collectors, so if you want to save yourself from these taxes you’ll have to do it yourself. I love that book. It amazes me that even though it was written in a different “era” the time-tested principles still apply.